Image: Sam Hodge wraps up a Viking with Luke Stephens and Kieran Webb in support courtesy of club photographer Lewis Mitchell. The All Golds put in a huge defensive effort against a strong Vikings side to progress to next week’s West of England Grand Final in Bristol where they will meet reigning Champions Swindon St George. To hold any side to just two scores in the energy-sapping conditions the country has seen this summer is a tremendous achievement. The Vikings ran hard and strongly but the All Golds got two or three men in the tackle each time and snuffed out the danger. On the rare occasion the line was broken, the defence quickly scrambled back into position to deny the visitors and the All Golds kept their line intact for the entire second period. 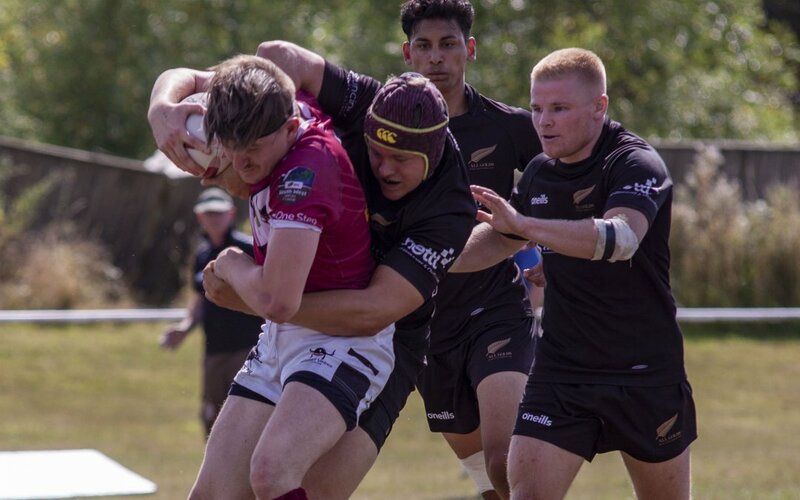 In attack, the All Golds proved themselves just as effective and a three-try scoring burst midway through the second period eased them into the lead that took them into the final. Unlike the match between the sides a fortnight ago, the All Golds kept their line intact during the hectic opening exchanges and struck first after ten minutes, Josh Llewelyn showing plenty of strength to force the ball down despite the attentions of three defenders. Five minutes later, Ash Lewis was held up over the line and from the next play, Luke Stephens darted over from close range. Callum Merrett added the extras to record his 150th point of a hugely productive campaign. The home side held on to their two score advantage until ten minutes before the interval. Both sides had bashed each other almost to a standstill until finally Marcus Brooker forced his way over for a try goaled by Dan Hinton. However, the Vikings quickly handed the initiative back to the All Golds as the restart bounced into touch and three plays after the resulting scrum, Sean Roberts placed the ball over the line. With Merrett off the field after suffering a hamstring injury, Michael Holden added the goal. But then it was the All Golds who squandered the advantage as they conceded a penalty on the restart and Cam Hellier went over to score, again Hinton added the goal. It could have been worse for the home side as the Vikings went over again just before the interval, though the referee saw an obstruction at the play the ball and disallowed the score. Had the Vikings scored then to level the scores – and perhaps take the lead with the inviting conversion – the second half could have posed more problems for the home side. As it was, the All Golds took a grip of the game from the opening moments and never let up. Aedan Coleman extended their lead in the opening minutes of the second half slicing through the defensive line to touch down for an unconverted try. The home side were then forced on the defensive but they raised the intensity of their tackling driving Viking raiders back and forcing errors. From one, a poor attacking kick by Will Tobin, the All Golds went downfield, won a penalty late in the tackle count and Patrick Crummay capped another excellent individual performance with a try. Suddenly, the Vikings were rocking and Stephens put Alasdair Anderson over by the posts three minutes later for a converted try. Five minutes later, Coleman again slipped the net to score, Holden’s goal pushing the score to 38-12 and putting the home side virtually over the line. They almost had more points after another rampaging Crummay run downfield but the chance went begging. However, with ten minutes remaining Jack Uren twisted and turned his way over for the final score of the game. It was the All Golds’ hundredth try in just nine games this season, which shows the side has supreme attacking skills, but this particular win was built on the other side of the ball where the real hard work is needed. ALL GOLDS: Josh Llewelyn; Michael Holden, Joe Uren, Josh Stafford-Smith, Aedan Coleman; Jack Uren, Callum Merrett; Patrick Crummay, Luke Stephens, Ash Lewis (Capt. ); Jordan Smith, Dean Cooper; Brandon Lamb; INTERCHANGE: Sean Roberts, Tom Gaffney, Sam Hodge, Kieran Webb, Charles Lichtenstein, Ryan Tanner, Alasdair Anderson. VIKINGS: Ozzy Flowers; Jacob Hill, Steffan Pearce, Harry Brooker, Cam Hellier; Dan Hinton, Marcus Brooker; John Ferguson, Doug Caddick, Jack Monk, Regan Walker, Fergus Wood; Will Tobin; INTERCHANGE: Ed Tye, Brad Evans, Callum Warren, Dwayne West, Jonathan Dicker, Dean Brooker.